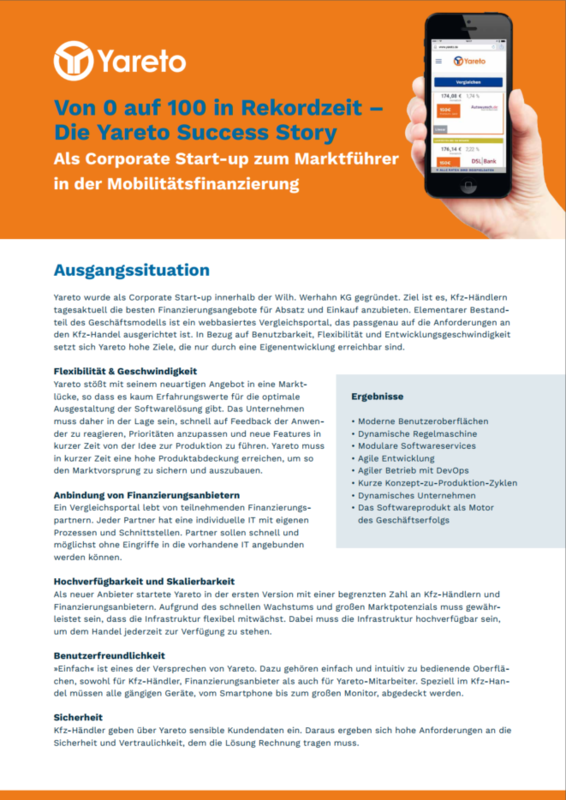 In 2017 PLEUS Consulting supported Yareto GmbH in the development of their new independent comparision site for the automotive finance industry. Yareto is a fintech company that specializes in automotive financing. In 2016 the corporate startup was founded to build a brand new comparision site for the automotive finance industry. The site enables car dealers to compare credit offers in the areas of sales financing and purchase financing. Lenders get access to sales channels they couldn’t serve before. 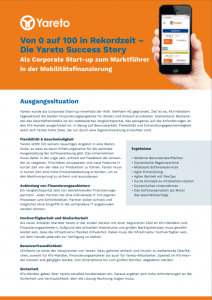 PLEUS Consulting supported Yareto in setting up a Creative Software Workbench. The Creative Software Workbench aligns technology, processes and people in a way that creates an environment in which high quality digital products can be developed in short time. The front-ends were developed using modern web technologies such as Java-/Typescript, HTML5, CSS and Angular. For the backend Java Enterprise (JEE) and a Sustainable Service Design approach was utilized to design and build a backend with a high degree of reuse and scalability. The service landscape was established using Domain Driven Design principles. Operations was performed using cloud platforms. On the technical side, PLEUS Consulting supported the teams as Lead Developer. In the area of agile techniques, PLEUS Consulting supported the development teams as Agile Coach. The combination of those roles worked quite well especially in the phases of seed and growth. With these roles the company received thorough support in the areas of technology and methodology. The project has shown that with a combination of modern technologies, agile approaches and the right people a very short concept to market cycle can be achieved, creating competitive advantages. This is what the Creative Software Workbench is all about. You can read more details about the project in the official success story. More info about the Creative Software Workbench can be found on the official website.